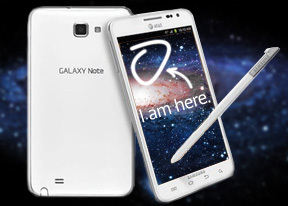 The Galaxy Note organizer has been redesigned, to make maximum use of the S Pen. The calendar offers seven different types of view, instead of the usual four. There is now a three-day view agenda and tasks right in the calendar app, instead of needing separate apps for them. Setting up a new event is quick and easy, and you can also set an alarm to act as a reminder. We found the agenda view, which shows a list of all the calendar entries from the recent past to the near future, particularly useful for organizing your time. There is also a calculator aboard. It is nicely touch optimized - the buttons are big enough and easy to hit. You can adjust text size and use cut, copy and paste. The Samsung Galaxy Note I717 features a great alarm clock application as well, which allows a huge number of alarms to be set, each with its own start time and repeat pattern. You can also activate a Smart alarm for each of them, which will activate a pre-set amount of minutes (between 3 and 30) before the main alarm and wake you up gently by starting off quiet and gradually increasing the volume. The usual Memo app has been replaced by S Memo, which lets you use the S Pen for taking notes, as if you have an actual notepad on your hands. The S Pen has plenty of useful tools for that and works quite smoothly, so you will hardly ever end up making memos on the Note the old-fashioned way. There's also the Mini Diary, which lets you also attach pictures and locations to your notes. The Samsung Galaxy Note I717 comes with a GPS receiver, which got a satellite lock in under two minutes with A-GPS turned off. A-GPS can speed this up quite a bit, but requires Internet access. We didn't experience any issues with the GPS performance. With a screen as large (and even larger) than most dedicated SatNav units, with excellent sunlight legibility and plenty of storage, your money be better spent on a good app rather than a dedicated SatNav unit. The app now uses vector maps, which are very data efficient and easy to cache. It will reroute you if you get off course, even without a data connection. The latest version also supports indoor navigation for popular shopping destinations and airports across America. It is still in Beta though. With a 1.5GHz dual-core CPU and powerful graphics chip, the Samsung Galaxy Note I717 can run every Android app designed for phones. The OS version is 2.3.6 and there will be an ICS update before a huge number of apps for this one accumulates, so you won't have any problems on that account either. The Android market is the fastest growing app repository around (also the one with the most free apps and number of downloads), so you can be sure that you won't be having a shortage of software to install on your Galaxy Note. True, some apps aren't designed to work on a WXGA screen, but most scale well, so the only thing you have to worry about is finding enough time to enjoy all those apps. If by some reason, the soon-to-become number 1 app repository on the market isn't enough for you, you might want to check out some of the alternatives. Amazon has set up its own appstore and so has Opera, plus a few more minor app stores here and there. Choice is one of the best parts of the open platform.